Select a topic area from the list below to get started. Each topic area includes an overview, objectives and data,* and evidence-based resources. Topic areas marked "new" were not included in Healthy People 2010. 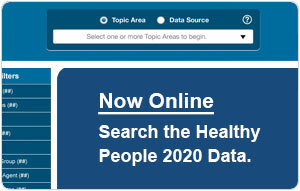 Whenever possible, objectives and data include a link to the related information in Healthy People 2010.